Today I ventured into no-woman’s land. That’s to say, I ate lunch in boy’s camp. [Side note, did you know that women were not allowed past the infirmary until 1966? That’s a whole other blog post!] And OH, how much fun did I have?! First of all, lunch was incredible. Pork loin cooked to perfection (thank you Lois), mashed potatoes, apple sauce, broccoli, bread and pumpkin cake for desert. I *tried* to avoid the cake, but Lordy, it was just too good. The bugle calls the waiters to lunch ten minutes early. They line up in the kitchen, trays of food in hand, and once the rest of camp is in the dining room, the waiters process in. Waiters line up in order from youngest cabin to the oldest cabin. And I have to tell you guys, I got choked up. I watched the smallest boy, a young man that I don’t know much at all, walk past me – carefully, wobbly, balancing the tray of food for his cabin. Next, the Colt division, slightly more confident. Then the Labrador puppies of camp, the Juniors (their bodies haven’t quite caught up to their feet, you know?!) sort of gallop past. And finally our oldest waiter. Senior, Davis Altorfer, *fourth generation* Highlands man and a boy I’ve known since he was *this big*, strolled through the door, confidently wielding his tray, looking around, laughing. It was like I saw the face of *my* son pass quickly by, through the ages to ultimately end up six feet tall, with a goofy bandana around his head (but totally rocking it, you know?!). You don’t know when these moments are going to sneak up on you, but man-oh-man. It got me today. All weepiness aside, there are incredible moments in that dining room, hidden away from us lady-folk, specially reserved for campers and staff men. Moments like when Kent Taylor was recognized by Kent Overbey for climbing the stone fireplace blindfolded and then teaching a class to graduate Adventure/Ropes. Like when the boys that got stuck in the kitchen just before announcements reappeared from the kitchen and everyone clapped for them! (So funny!) Like when Andy blessed the mysterious aroma of the garlic bread (what?!). 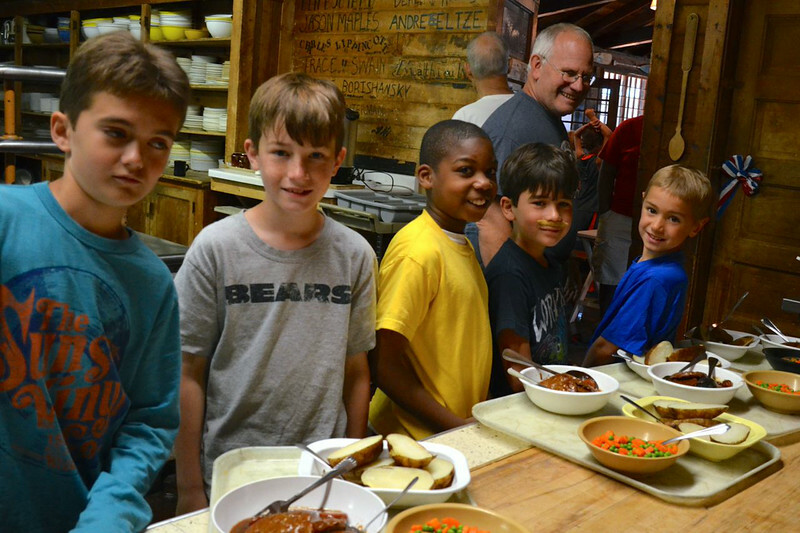 We all know that breaking bread with people is sacred, but I’d offer that at Camp, these meals are extra special. The boys haven’t realized it yet, but they’re changed beings after this third week. As we ease into the last week, it’ll sneak up on them. And they’ll be processing the changes that have taken place this summer all year long. Camp just gets under your skin that way. This summer. This life! It MOVES, folks. Here we are ten days out from the end of our 111th summer. I don’t want it to stop! We have so much further to hike! So many more balls to throw. So many more times to jump into Plum. But it’s looming out there. For now, I’ll sit lakeside, talk to my future Senior campers in the boating bay and discover the mystery of garlic bread. I’m not ready to pack up yet! Anyone who has been to camp knows of our famous towers. Our lake neighbors love to come down and gawk as the boys perform feats of courage and craziness as they leap into the air, 18 feet above the water. From down on the dock, the towers are really not that daunting. But once you climb them, and stand on that third platform in particular, it can seem like you’re 500 feet off the surface. And it can be intimidating. I still get nervous when I stand up there. So the other day when I saw a camper from way down in Cabin 25 take his first step off Tower Three I knew I got to witness one of the greatest moments of the summer. “Give me the courage of the man who knows that if he will, he can.” The little guy who *jumped* pictured above. That little guy from Cabin 25 stood on Tower Three for 45 minutes. Then the bugle blew, calling the waiters to come get supper ready. But the lifeguards didn’t budge. And neither did his cousins (all 4 of them). Everybody stood by, eyes to the sky, waiting. Finally, first call blew, calling all of us to supper. And suddenly he did it – he took off of that tower and even before he hit the water the roar of the crowd erupted. It was awesome. He emerged from the water triumphant – beaming with pride and accomplishment. All of our sons are experiencing plenty of soul-stretching, discomforting moments of first-ness all the time. And when they do something new the smiles that shine forth from their faces are those of young men who know that they are living into a new reality; a world where they are beginning to get the sense that if they set their mind to something, then chances are good that they can accomplish it. Whether it’s jumping off Tower Three for the first time, or simply being away from mom and dad for four weeks. It is a special thing to witness those breakthrough moments. And it is a moment that I don’t think any of us will soon forget. Whew!! What a weekend! Have you had a chance to look through the gallery? Yesterday was a gorgeous day. Hot and sunny. It may have been the best day all summer! The Steeplechase, Senior Carnival and Games on the Hill were EPIC. Call me crazy, but it’s a day like yesterday that really makes camp feel like a big family. We are bonded after participating in decades-old traditions. One hundred and eleven. Now that’s a birthday, you guys. We did our very best to celebrate in style! The biggest Seniors start off the race with a bang. Today it seems like someone must have known that we were tired and gave us a cool, quiet and intermittently rainy day. The kind of day that makes turkey dinner taste especially good! During Sunday Assembly, we got to take a look at some old medium-format photos of camp from *way* back in the day. Andy walked us through a little history of the first few summers at camp, when the boys simply felled trees and cleared the space for what is now Junior Hill (not sure what that activity would have been named. Lumberjacking?). You might find the history of camp interesting, too, and if you haven’t already, take a look at the Highlands Archives for all sorts of fascinating stories about former campers and staff members. After our brief history lesson Shaun Trenholm offered a reflection on the art of saying “thank you” in a letter. Shaun’s words remind me how lucky we are to know each other here at Camp and how each one of us has something unique and important to offer to the group. Shaun’s legacy at Highlands is legendary. He started Highlands as a camper in 1968 and then started coming back as a counselor in 1984. I’ve not met many people that illustrate the Highlands Honor Camper Qualities so well. THANK YOU Shaun for all that you do for Highlands! After the noon meal, we enjoyed an extended rest hour. Then boys enjoyed open activities this afternoon. The best thing about Sunday, though, is Sing. The fun just keeps on coming! We are looking forward to the week ahead. Week three of four, my favorite week at camp. The boys know each other now, and real friendships have developed. Many guys have been on their trip. They have attended all the activities and had the opportunity to experience trial and failure and then…success! I am incredibly happy that *my* kid has the time and space to work on dropping a ski. He’s been at it for two whole summers, and he got very close on Friday. He’ll get assigned to skiing this week, and he’ll turn up at free-time and I bet he is slaloming by this Friday. That’s the true gift of four weeks at Camp. Time and space to figure out what you are good at, and what you would like to improve upon. These boys amaze me. From the Cub that’s learning to repel in Adventure, to the Senior that’s hiking 100 miles across Isle Royale – I’m inspired by them. I’m inspired by our counselors that have the patience to teach and coach them. I’m inspired by the opportunities for leadership our older campers have. Your boys will have four (or maybe seven) weeks to play, grow, learn, stretch and lead. And Camp has had 111 years to play, grow, learn, stretch and lead. Wednesday is Division Day at camp, a time when boys divvy up into their divisions and spend the afternoon together. The Colt division gets to cruise into town today to goof off at The Waters water park in Minocqua, grill out at Clear Lake and end the day watching the awesome Min-Aqua Bats ski show. It’s an action packed day for sure, but they aren’t the only ones having a great time. The Cubs are packing up and spending the night on local Pallette Lake, they’ll roast marshmallows, play in pristine water with a sand bottom and get good use out of their sleeping bags and flashlights! God bless those Cubbie counselors who wrangle all twenty or so eight, nine and 10 year olds! 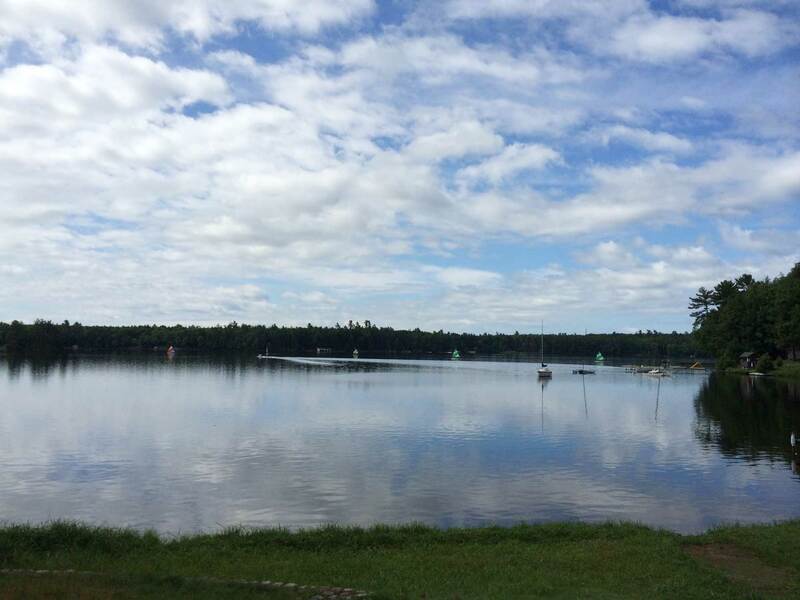 The Senior division will convoy down Plum lake by whatever means available – kayak, canoe, etc. to tie up at the Sayner Pier. They’ll cook out in Sayner and play softball on the Sayner ball field. Juniors will have camp all to themselves tonight, cooking out on our large stone grill in the adventure ropes area and play games. These Wednesdays are a nice break in the routine. They offer up a little more free time to the boys, a slightly longer rest hour and time to just enjoy being together with all the boys in their age group. The cooks like it too, as it’s their night off! Everyone gets into the action during the Steeplechase. Pictures from 2013’s race give you a little taste of the fun! We are gearing up for the camp birthday this Saturday. We will turn 111 this year, and I have to say, I think we’ve never looked better! 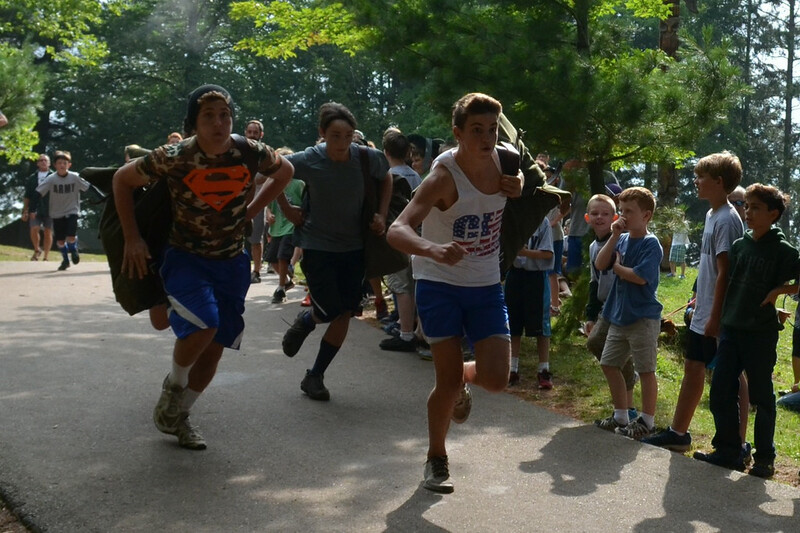 We celebrate our birthday each year with the world-famous Steeplechase, a two and a half hour Army/Navy relay race, with a course that runs through camp and even around Five Pines and to the Star Portage! Each boy participates in their own crucial event in the race and it’s a rip-roaring good time. Events range from pin bowling, to soccer dribbling, to jumping through a hoola hoop from Tower Three. The relay culminates during the nail-biting water boil and Baker tent set up and breakdown. The fun starts about 9 a.m. and goes on throughout the morning ending around 11:30 a.m.
At 3 p.m., the Seniors host camp down in the Row for the random-little-known-games Olympics – the Senior Carnival – complete with homemade dunk tank, pillow fight jousting and bug juice chugging! And what do you win at this Carnival? Bachmann Bucks of course. The fun doesn’t stop there. After the Carnival, we have a picnic supper on Junior Hill followed by Games on the Hill, also a Highlands highlight. This is also an Army/Navy competition filled with wheel barrow races and the copyrighted Broom Race (you have to see it to understand it). Saturday is ACTION PACKED and is my favorite day of the whole summer. A great day to ski, sailing, not so much! The weather continues to be dry and cool, which is better than wet and cool. We’ll take it! Check out this glassy lake photo taken just an hour ago. I don’t know how those sailors got all the way out there with such low wind! It’s just camp magic, I suppose. We hope you guys at home are having half as much fun as we are here at camp! Hey Highlands fans! First, an apology on no blog post until now. I hope you have all been thoroughly digesting the many great photos in the gallery (thank you Mike Bachmann) in the absence of a written update. Enough apologies and on to the news! Today is HOT. Hazy and sweaty. In fact the office assistant, Sally Glowiack just said, “Last week we needed a heater and this week we need a fan.” Indeed. While it was cool last week, the boys hardly seemed to notice. 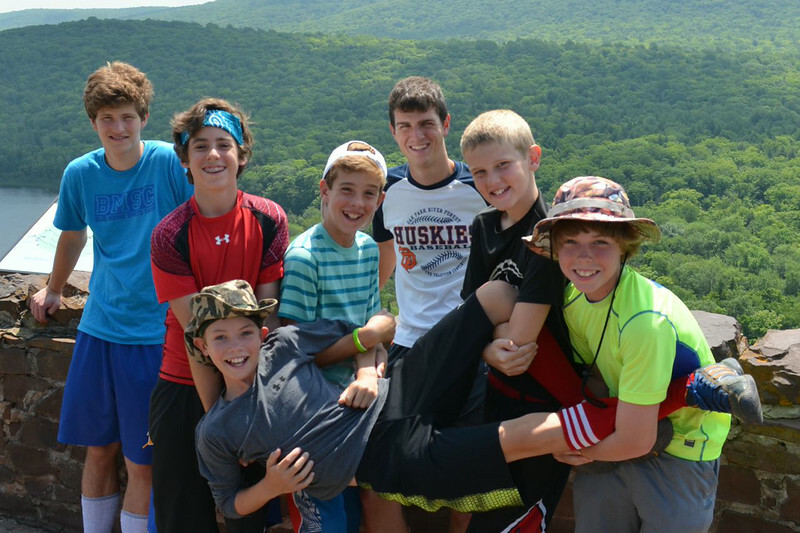 They happily skied, canoed, played soccer and all that other stuff that boys do at camp. Cabins 2, 4, 5, 7 (basically all the Seniors not on trips!) and cabins 23 and 25 all got to enjoy canoeing today. Free swim was very popular today at free time! Cabins 21, 22, 23 and 24 channeled their inner Katniss today at archery. Tripping is a blast at Camp Highlands! 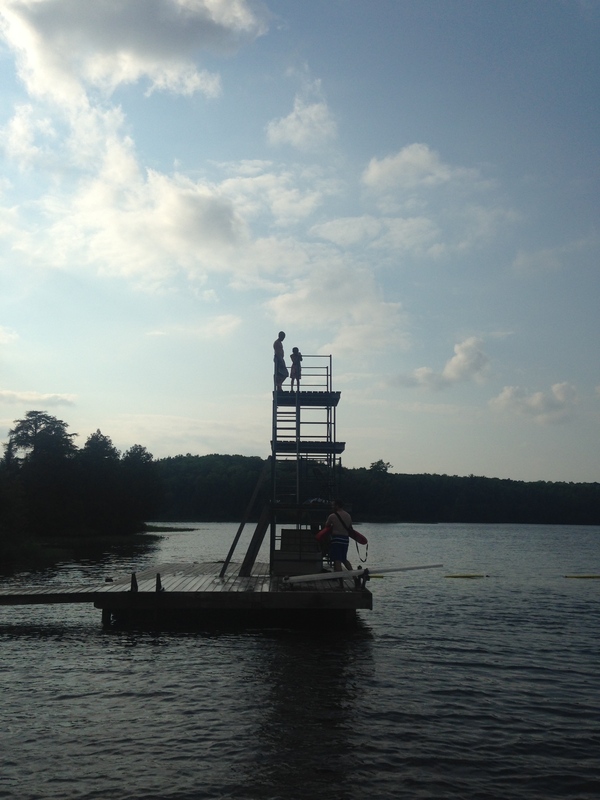 This is the height of tripping season here at camp – about 30 boys are out on trips right now. Cabins 14 and 12 just set out for their three day hike in the Porcupine Mountains this morning. I heard from one of the counselors that their camp site tonight is really fabulous. In fact, a million years ago before Andy and I had kids, he took me hiking up there and we lounged on large flat river rocks while the water flowed around us at the exact camp site where your kiddos will be spending the night! That’s quite a reward after their nine mile hike the boys were looking down the barrel at this morning! Cabins 15 and 17 from the Colt division just set off on their three day canoe trip on local waters. Folks, if I could sneak out of camp for three days, this is the trip I’d want to do. The boys paddle on a local chain of lakes and learn how to make double decker PB&J pita sandwiches (at least that’s what my kid learned to do on that trip)! They swing on a rope swing and have a generally fabulous time. We hope it continues to stay nice and dry for them! 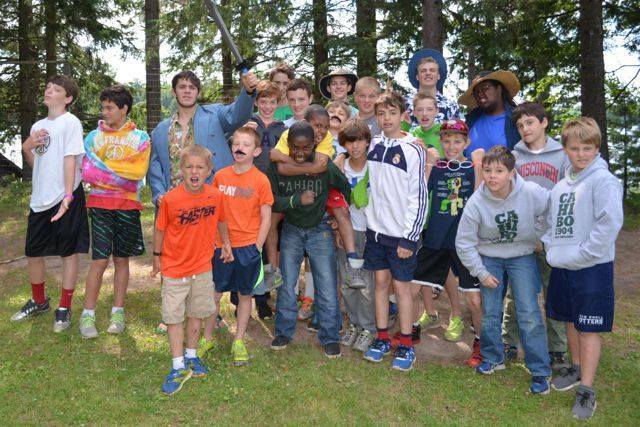 Yesterday Highlands boys enjoyed some friendly competition with a neighboring camp, Red Arrow. Our Colts won soccer 1-0 and our Seniors basketball team gave a solid showing, to end in an unfortunate loss. Last night your boys enjoyed their first of three Sunday Night Sings. Sing followed open activities all afternoon, where boys chose their favorite activity. Also, back by popular demand are Pinewood Derby Cars! Fifty boys will craft their cars over the coming weeks and then compete in some serious racing toward the end of camp. For lunch today? Chicken tenders. Lois reports that the boys ate 350+ and would have gladly eaten more. You’ve gotta love it. Honestly, I wish I was a camper most days˜Ñ. And on that note… I ❤ CH // tracy b. 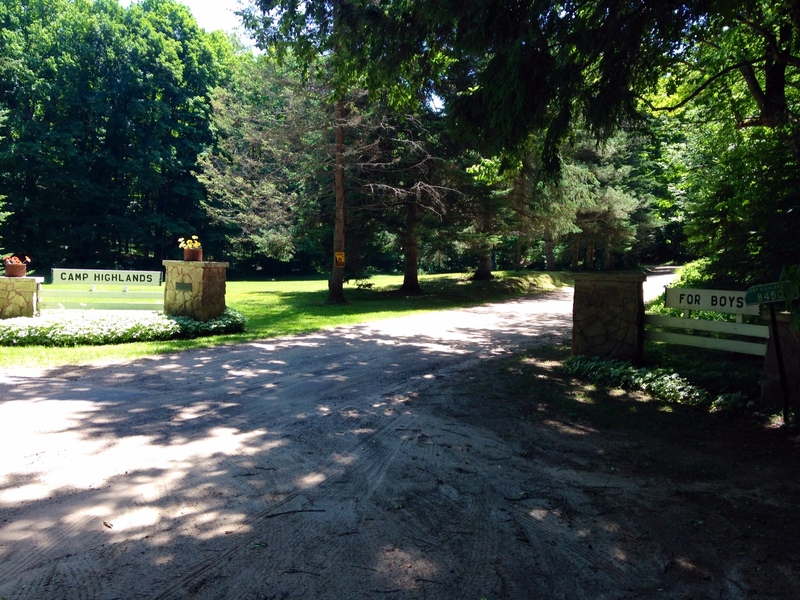 Beyond these gates lies a magical place called Camp Highlands for Boys. If you’ve been here, you know. A flight from somewhere far away, an epic bus ride, a never-ending car trip – by whatever means, your boys will all be in camp this evening and we can’t wait to have them with us. Can you imagine how these boys feel? So excited – the promise of new friends, fields to run, boats to sail, balls to throw, songs to sing. There is an unmistakable buzz in the air on this day. We. Are. Excited. The buses will pull into camp around 5:15 this afternoon, through those magical white gates that say “Camp Highlands,” and the boys will instantly be transformed. The sweet sound of the bugle calls and the entire staff and all boys that arrived by car will spill out onto the ball field to cheer for the guys arriving. It’s one of my favorite moments at camp, when boys that haven’t seen each other all year are reunited with bear hugs and high-fives. And the new kids? As a mom, I always worry about these guys! But they are intercepted quickly and their gear is enthusiastically hauled off, and the adventure begins. There will be jitters at supper, but it’s spaghetti, something that almost everyone likes. Afterwards, the evening is filled with tours of camp, some baseline rules and a campfire, the first of many they’ll have at Highlands. We know you moms, dads and caregivers will miss these guys. Our priority is your child. Our staff is ready to give them the guidance and support they need to try new things, to step out of their comfort zone and to experience a feeling of self-reliance and confidence that is difficult to duplicate anywhere else. Our motto this summer is, “Camp Changes Lives.” It is so true. Remember that most questions you’ll have can be answered with the new and improved Highlands Handbook. The Bunk Notes code is FYXKNRWU. Everyone needs to set up a new account this year. And remember that if you’d like your son to write you back using a Bunk Reply, you must attach one when you send him one. The Highlands gallery password was provided in an email, but if you still need it, please email or call us (it’s also in the Handbook). The best time to reach us is between 9:15 a.m. and 12:30 p.m. If we don’t answer the phone, leave a message and we will get back with you! We had an awesome weekend! You likely saw the pictures from Pirate Day on Saturday. We had somuchfun! The boys were placed into four teams and spent the day in pirate-themed activities. I don’t know who had more fun, the campers or the staff (including Andy Bachmann, who fully embraced his role as Black Beard). Saturday evening we had a picnic supper on Junior Hill. It was a great end to the day. Sunday’s Assembly allowed us a time to reflect on our summer so far. Boys shared in their cabin groups whether they had achieved the goals they set during the first week at camp. If they hadn’t, they were prompted to think about what they could do to achieve them this week. Assembly is a quiet time in camp. After a fast and fun week, it’s always good to have a few moments to think about the incredible achievements the boys have made. Sunday afternoons are open activities, so boys can choose which activity to attend in order to work on Achievement Credits or just participate in whatever their favorite activities might be. And of course Sunday Night Sing is a blast. The power was knocked out by a brief thunderstorm. 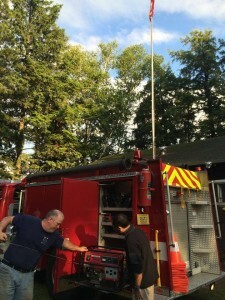 Conveniently our caretaker Kevin is the fire chief and he cruised up Junior Hill in a fire truck and hooked up a generator to run the electricity for the lantern slide projector! What a hoot! The week ahead is going to be a good one. Today is the final Division Day. The Cubbies have the bus today and are headed to the Wildwood Wildlife Park and then to the Lumberjack Show. They have a big time, complete with ice cream at the corner store! The other divisions have camp-based activities and a cookout tonight. Tomorrow will bring to Sayner, WI the 2014 First Term Stunt Show. We would call it a talent show, but that might be a stretch! In all honesty, it’s a blast – and rumor has it there are several outstanding skits and performances planned. Thursday evening is the Kerchief Ceremony, a quiet and special time at camp when boys are recognized for their achievements at camp. They’ll don their red kerchiefs and each boy will place his stick into the “fire of friendship.” In this busy, changed world, it’s so neat that boys get to have this sort of rite-of-passage experience. You are free to take your son home with you, or you can pick him up by 9 a.m. on Saturday when First Term comes to a close. We are really looking forward to seeing all you parents and caregivers, but we aren’t ready to stop the fun yet! Off we go to make the most of this last week! We’re feeling extra proud of our flag today! Hey Highlands fans! Happy Fourth of July! We drag our celebration out over the week here at camp. As you know, we celebrated the Fourth last week during our annual track meet, but the fun doesn’t stop there. We’re cranking Motown in the office and getting geared up for a great day! Today, we’ll be eating a red, white and blue fruit salad with strawberries, blueberries and bananas along side Salisbury steak and mashed potatoes, peas and fresh carrots. To finish off that all-American meal, we’ll have blue cake with cream cheese frosting. YUM. The weather is gorgeous. Cool in the shade, warm in the sun. Nice and crisp. The perfect day for land sports like baseball (cabins 11, 14, 21, 24, 15 and 18) and soccer (cabins 21, 16, 17 and 25). There’s also a sweet breeze on the lake. It’s a nice day for a sail (cabins 25, 18, 23). First term is a whirlwind of trips. As you know, each boy goes on an age-appropriate trip. 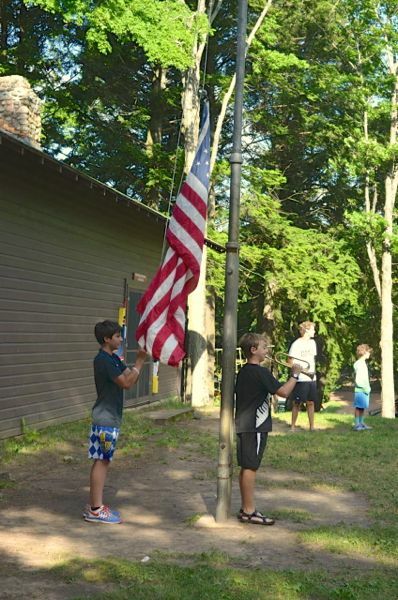 Cubs have a weekly overnight on Wednesday, Colts enjoy the sweetest canoe trips on a local chain of lakes, Juniors hike in the Porcupine Mountains. Cabins eight and 12 are out on the trail as I write this. The Seniors go on an assortment of big trips. Right now we’ve got Seniors canoeing in the Boundary Waters of Minnesota and boys hiking 100+/- miles on Isle Royale. Tonight the boys that aren’t on a trip will load up on a bus to head into the booming metropolis of Sayner, WI (pop. 207). I have traveled around the world, and have seen fireworks in Sienna, Italy and Okinawa, Japan – and I’m here to tell you, the fireworks in Sayner, WI are astounding. Our very own caretaker Kevin Rassmussen (also the Sayner fire chief!) heads up the festivities and saves Camp Highlands a primo viewing spot and positions our buses for a quick getaway. It’s a late night for these guys, but so fun! Can you believe that this time next week, you’ll either be here at Camp or about to pick your son up at the airport or bus!? Time flies when you are having fun. Remember if you haven’t RSVP’d to our family picnic on FRIDAY, we encourage you to do so. We would love to see you! Last night I could hear the Cubbies finishing up their game of Mafia after a lively and adventurous Division Day. Division Day is when the divisions spend their afternoon together, playing games, tubing, hangin’ out, etc. They always end their day with hotdogs and marshmallows around the fire. Now, I’m not sure exactly HOW to play Mafia, but I know it involves one guy being the “mafia,” one guy being a doctor and one guy being a police officer. They all put their heads down, then the mafia guys lift their heads and designate someone to “off” and then the doctor lifts his head and designates someone to save, then the police officer gets to accuse someone – or something like that. I say this because I’ve never actually SEEN it played, but last night I HEARD it loud and clear. One of the great things about being in the north woods is that there is almost NO noise pollution. Which means, on a beautiful clear night like last night, with no wind and a gorgeous sunset, I could hear everything those Cubbies said, even all the way over on the Point across the lake; which is where they were. And they were having a blast. Funny thing about a campfire; it can make something as seemingly simple as lifting your head and trying not to giggle and pointing at your cabin mate seem like the greatest thing in the world. Whether it’s watching a marshmallow burn to a crisp, or gazing deeply into the embers of a dying fire, there is something magical about that time. My son just returned from his three day hiking trip in the Porcupine Mountains. At this point in the summer, many of your guys have been out on their trips and have returned. His report post-trip was bubbling with excitement and pride; though most of the stories were of the zany misadventures and goofy things that happened. They always remember the goofy things – like when Jackson’s shoe got stuck in the mud, and he then accidentally sank his socked foot deep into the same mud; or when they all woke up in the morning piled in a heap in one small corner of the tent, with Eugenio’s feet in his face and Caleb’s head on his chest – and plenty of space in the other half of the tent. One of the insights that my son relayed to me was a really cool realization he had one night, as they were all gathered around the fire. He looked around him and exclaimed, “There are FIVE different languages sitting around this fire!” And he was right. Two boys were from Mexico. One counselor has been preparing for his year abroad in China, and he speaks mandarin. One boy lives in France. And one boy speaks sign language. And yet here they were, this motley crew, gathered around the fire laughing at their misadventures, giggling about muddy socks, scheming how they can swipe the sweet campsite from the other camp tomorrow, having the time of their lives. One of the greatest things I ever learned to do here at Camp Highlands is to make a one-match fire. A skill I still practice whenever my daughters beg for s’mores; and now that I think of it, a skill I will add to my resume. Because when you make a fire you do more than just spark a heat source. You invite imagination and laughter and thoughtful contemplation. And that, my friends, is a pretty awesome gift to share.